Reel dimensions: 5 reels, 4 symbols per reel. Author's Rating: 8.0 / 10. Buffalo is one of Aristocrat's Xtra Reel Power line, which means that there are no "lines." - if a symbol appears left to right, then it will be paid. Technically this is the same as 1024 paylines, but who's counting? The premium pay symbol is the Buffalo itself - offering 300 coins per way if you manage to get one on each reel. Because this is every line is a pay line, the amount you win will go up exponentially for each buffalo on the reels. For example, in the above picture there are 13 buffalo, and the player has won 108 x 300 x 5(for betting 5x the minimum bet) for a total win of $1620. The free spins bonus in Buffalo is triggered by getting three or more scattered coin symbols. 3 coins awards 8 spins, 4 coins awards 15 spins, and 5 coins awards 20 spins. As with many slots, the bonus games are where the real winning potential of Buffalo comes out. The wild symbols on reels 2, 3, and 4 are replaced with wild multiplier symbols - 2x or 3x. This significantly increases payout potential as these multipliers can stay with themselves. If one manages to get all three wilds at once, a win can be multiplied by up to 27x. Combine this with a few buffalo and you're talking some seriously large pays. Re-triggering the bonus round is also easier than normal if you're already in the bonus spins. Only two coins are required to add more - awarding 5 additional spins. Buffalo is almost always a penny game, though it can occasionally be found with a higher coin in high limit rooms. Returns can vary between 89% and 94.85% depending on the casino. Buffalo is a relatively low variance game, so you should be able to play for a while. Lil' Red is another entry in WMS's Colossal Reels series. This series is characterized with one 5x4 reel set on the left and one 5x12 reel set on the right. There are stacked wilds, and very long premium pay symbols on the larger "colossal" reel set. If a player manages to fill a whole column in the left reel set with stacked wilds, then that entire column of wilds transfers over to the 5x12 set of reels on the right also, creating a gigantic 12 wild symbols! The bonus free spins can be initiated by getting three or more bonus symbols. The symbols appear on reels 1,3, and 5 of both the 5x4 reel set and the 5x12 reel set. A player only needs 3 total bonus symbols to trigger the bonus. That is, you can get one bonus symbol on the 5x4 set and two bonus symbols on the 5x12 set and that would still trigger the bonus. One different in Lil' Red vs. many other games in the Colossal Reels series is that during the bonus spins, any wilds which a player gets on the 5x4 reel set will nudge to fill that entire reel - and therefore will copy over to the colossal reel set as described above. However, the tradeoff for this is that pays on the 5x12 reel set are only at 2x vs at 5x on other Colossal games such as Forbidden Dragons. This creates slightly less volatility than other games in the series. If you're looking for a moderate volatility game with a decent number of bonus rounds and plenty of premium pay symbols, Lil' Red may be your ticket. Progressive: Available in stand alone, and major/minor progressive versions. Can also be linked to a "group" game like Leprechaun's Gold. Bier Haus is a favorite slot for many, including myself. G+ Deluxe machines generally carry a mid-to-high level of variance, and Bier Haus is no exception. However, frequent appearances of wild symbols help to bring the variance down below other G+D variants. Bier Haus is usually found in 30 or 40 line 1c variants, but can occasionally be found in 100 line 1c or 20 line 5c variants as well. Bier Haus's main appeal lies in it's bonus round. The bonus is triggered by getting 5 or more left-to-right waitress symbols. The symbols usually appear stacked on the reels, so it generally only takes 2 to 3 reels of waitresses to get the required 5 symbols. 5 waitresses will award 5 free spins. For each waitress symbol over 5, you will get an additional 5 spins. (That is, 5 waitresses = 5 spins, 6 = 10 spins, 7 = 15 spins, etc...). Waitresses come in two types - green and purple. The majority of waitresses are green, but each bonus trigger generally has at least 1-2 purple ones as well. The catch is that the purple waitresses turn into locked wild symbols for all of the free spins. This trigger would award 10 free spins, with the leftmost three purple waitresses turning into locked wilds. Because of the locked wilds, it is not uncommon to have every spin pay something. Retriggers are also possible, which can add even more locked wilds to the screen for the remainder of your spins. Overall, Bier Haus is a great game - one of the most fun ones I've played. If you happen to see it in your local casino, I highly recommend you give it a try. Rebranded: No exact copies, but is part of the G+ series. Big Money Show is one of the entries in WMS's G+ series. G+ machines are generally known for their moderate volatility, and free spin based bonus rounds. Big Money Show's bonus round is triggered by getting three or more scattered bonus symbols during regular play. The player will receive 12 bonus spins regardless of the number of bonus symbols they get. On each spin during the bonus rounds, a random multiplier between 2x and 5x will be applied to the results. Some symbols on the 5th reel have a boomerang symbol on top of them in addition to the regular symbol. If the boomerang appears anywhere on the 5th reel, then the multiplier will be between 4x and 30x instead. In my experience the multiplier averaged around 7x. The bonus round may be retriggered during the free spins, resulting in 12 additional free spins. Rebranded: Van Helsing Colossal Reels is an exact reskinned copy. Also shares many features with other Colossal Reel games. Forbidden Dragons is the most fun I've had playing a slot in quite a while. I've played multi-games before, but this was my first venture into the Colossal Reels series. The game features a standard 5x4 reel set on the left, and a gigantic 5x12 reel set on the right. All reels stop in sequential order from left to right. 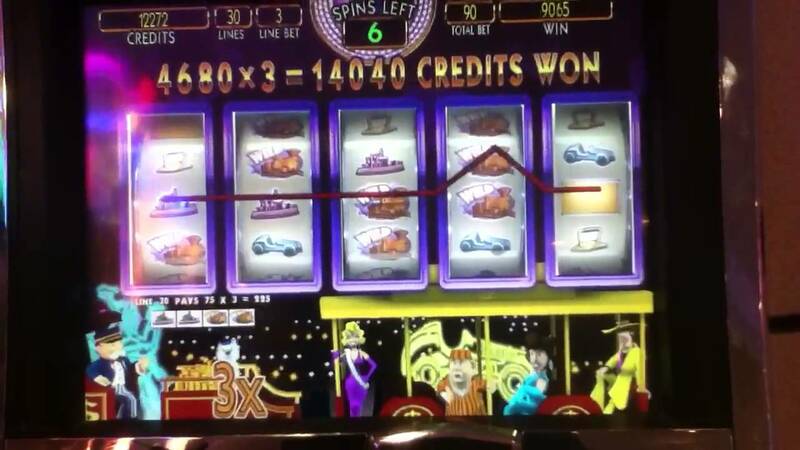 During the bonus spins, any pays that you pull off on the right colossal reel set are multiplied by five. This is creates a bit more volatility than the other games in the colossal series, but can create some pretty big pays. Overall I found this game quite fun, and one of the more original concepts I've seen from WMS recently. I'd suggest you give it a few spins and see what you think. Bonuses: Free spin bonus with mirror reels feature. Author's Rating: 8 / 10. Konami's Cassiopeia is part of of the Konxion series, which introduces a reel configuration of 4-5-4-5-4. A nice feature of this configuration for the player is that the lines are not confusing. A line is any two symbols which connect left-to-right. Lines don't scatter top to bottom or in any other configuration. If the symbols touch then it is a playable line. As a result of this, there is no choice to the player for number of lines to play - only bet per line. Cassiopeia features stacked symbols, including stacked wilds, both during the bonus rounds and during normal play. The fact that all symbols are stacked, not just wilds, as well as the game's relatively low number of symbols contributes to Cassiopia's low to medium volatility. The bonus is triggered by getting three or more scattered column symbols. During the free spins, Cassiopeia's mirror reels feature kicks in. This feature causes the 1st and 5th reel, and the 2nd and 4th reels to be duplicates. Therefore, if you line up symbols on the first three reels, you will automatically have the final two symbols to complete a 5-of-a-kind. When combined with the stacked symbols that are fairly common, it's not unusual to see larger pays during the game's bonus round. 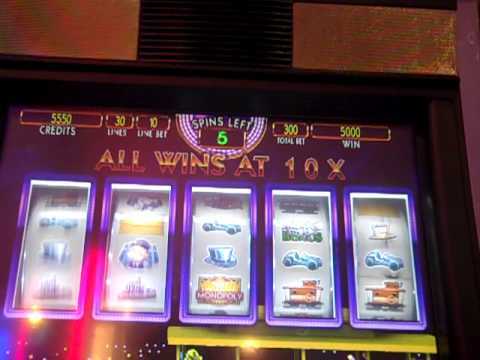 The video below features a re-triggered bonus round with a single pay involving stacked symbols.